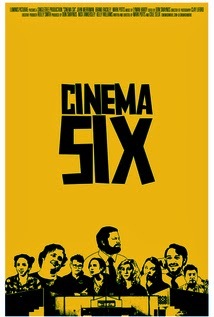 Cinema Six is the kind of movie you hope for when you take a chance on a movie starring nobody you've ever heard of. I love independent movies – good ones, flawed ones, and really, really bad ones – but the really good ones have a special kind of magic that are totally unique. At festivals over the years, I've seen a small handful of indies that legitimately moved me and stuck with me, and as recently as only five or so years ago, sadly if those movies didn't come out of the festival circuit with a distributor, that was it and they'd missed their window. It was like an awful, winner-take-all pilot season for the film world, except all of the money was being poured in by poor artists with big dreams, not studios who could absorb the production costs and then afford to shelve the final product. Thankfully, through the rise of video-on-demand, gems like Cinema Six have the potential to reach a much, much larger audience. So three cheers to an Internet technology that the NSA hasn't yet turned into a way to spy on us! There's a lot to love about this little movie, so I'll try to hit the high points quickly and adhere to the spirit of the "microreview." The plot is easily summed up by saying a group of employees at a small-town movie theater, all at different stages of their lives, each wrestle with maturity. One of the wonderful choices co-writers/directors Mark Potts and Cole Selix made in the script was to have each of the three central characters – Mason, Dennis, and Gabe – at different stages of their lives, which enables the film to deal with each of them facing their own, idiosyncratically frightening next steps. I vastly prefer this approach to what I'd consider the Apatow-standard, where all the characters are pretty much in the same zone, and the central character is the one individual allowed to rise up out of his own muck. Which brings me to point number two, which is that while this is (verbally, certainly) within the "raunchy comedy" genre, and much of the dialogue is VERY funny, it's never at the expense of character, which I am on record as saying was something I responded to in the Amazon series Betas as well. Third, the actors are all uniformly strong, with John Merriman and Brand Rackley displaying enough charisma to easily build an entire film around, an area where I find a lot of indie films wind up falling short. I liked Brand Rackley so much, that after watching this I tracked him down and cast him in a project I was working on, too. Finally, it was just really cool as a film nerd to see so many scenes set in the projection rooms, storage closets, and other out-of-the-way corners of a working movie theater that for all the time we've spent in cinemas, we've never really been invited into. Posted by Vance K - Resident cult film aficionado, unapologetic lover of bad movies, and Nerds of a Feather contributor since 2012.